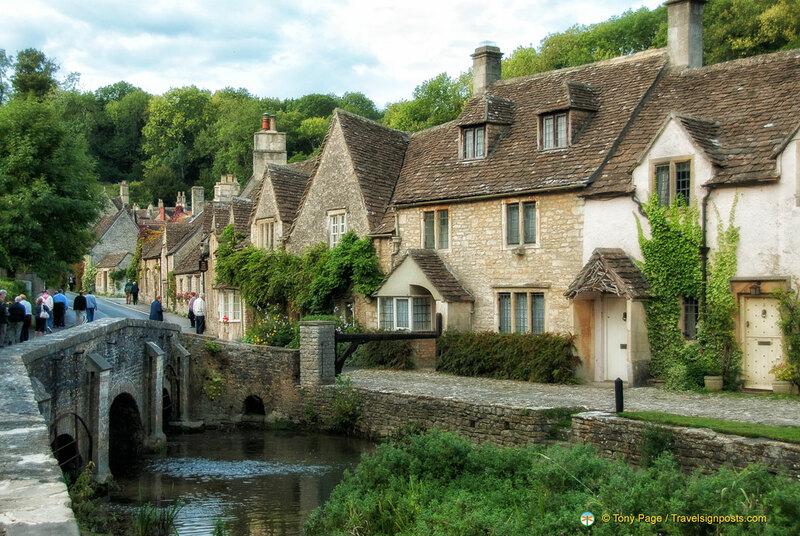 We were told that Castle Combe is the most beautiful village in England. The village is situated on the southern-most edge of the Cotswolds and a dinner excursion to the Castle Inn in Castle Combe will allow us to see fine examples of Cotswold-type houses. From our hotel in Bristol it was a 50 minutes drive to Castle Combe and peak hour traffic jams meant that we were a little late arriving. We were more concerned about the fading light and being able to take snaps of this beautiful Cotswold village rather than being late for dinner. When you arrive at Castle Combe, the one thing you’ll notice that is missing is a castle. There is no castle in Castle Combe today, but the earthworks of the castle and some bits of stonework are still visible if you walk to the original site about half a mile to the north-west of the Manor House. However, to make up for the lack of a castle, Castle Combe is indeed a very beautiful village and one which it seems time has passed by. There are lots of interesting features in this village which has been the setting for many movies such as Dr. Doolittle’s house (the Dower House), Robin of Sherwood, the Wolfman and as the village of Wall in ‘Stardust‘. Interestingly, watching Poirot and The Murder of Roger Ackroyd the other night we were excited to recognize the Market Cross in the movie. The Murder of Roger Ackroyd was mostly filmed on location in Castle Combe. the Roman Bridge – this one-sided bridge at the far end of the village is often referred to as the ‘Roman Bridge’. According to legend the ghost of a roman centurion had been seen standing guard. Quaint as they may be, this is a living village so respect the residents’ privacy. Don’t go into houses or stick your nose to the windows trying to look in, which some over-zealous tourists have been known to do. For those wanting to spend a few days in this beautiful village, The Castle Inn Hotel is right in the middle of the village. For something more luxurious, the Manor House is a luxury hotel surrounded by 26 acres of private parkland. In the village you will find a few B&Bs and self-catering cottages.